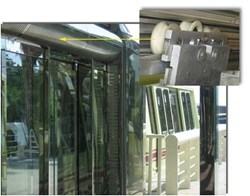 Of all the maintenance headaches associated with sliding doors, rollers cause most of the pain. Intech Corporation set out to detail ways that engineers, Architects and designers can solve the most common door hardware problems by simply changing the bearings used in their assembly. Power-Core Plastic Bearings features an entirely crystalline molecular structure that makes them more resistant to creep that results in flat spots when rollers are statically loaded over time. Metal rollers, while still the default choice for heavy doors, require ongoing lubrication. And even when lubricated, metal rollers can eventually wear out the door track. Plastic rollers, which are too often made from common engineering thermoplastic materials, lack dimensional stability when exposed to temperature extremes and moisture. They also tend to creep, developing flat spots under static load. When poorly designed or maintained, both metal and plastic rollers can also be noisy. In the case of metals, the noise occurs because of the metal-on-metal contact with the track. In the case of plastics, the dimensional changes and flat spots make for a rough, noisy ride. What goes around stays round. Power-Core produces highly concentric rollers that stay that way in use. The concentricity comes from precision machining of roller surfaces. And the dimensional stability is an intrinsic material property. Unlike most polymers, Power-Core does not swell if exposed to moisture. Its also stable across a wide operating temperature range of - 40 to 80ºC. No flat spots. Power-Core features an entirely crystalline molecular structure that makes it more resistant to creep that results in flat spots when rollers are statically loaded over time. A nice quiet ride. Power-Core rollers can damp vibration more effectively than metals. Power-Core also exhibits lower rolling resistance than metals. Taken together, these two factors result in sliding doors that operate smoothly and quietly. Keep on rolling. Power-Core rollers eliminate the metal-on-metal wear that can prematurely end of the life of metal sliding door rollers and tracks. And Power-Core needs no lubrication to keep rolling. For more information on sliding door applications—including load capabilities and design tips—read our sliding door white paper.